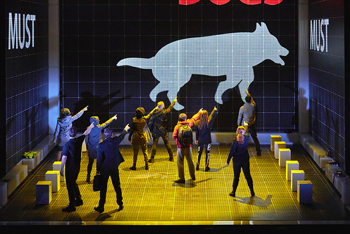 The Curious Incident of the Dog in the Night-Time 2017 tour includes, amongst its technical facts; that five tons of steel were used in the set transported by four lorries between venues, 234 sound cues are used, 2,136 data addresses, 699 pieces of chalk (for the whole tour), 892 pixel LEDs and eight projectors in the rig offering 11.6 million pixels of projection. Of course some people may wish me to discuss this play in less literal and technical language, discussing the emotional impact of the play and how aims and objectives were met in a more subjective way. For those familiar with or have similar conditions to our protagonist Christopher who suffers from “behavioural problems, most likely Asperger Syndrome,” it may be easier to process such technical facts and focus on the certainties of the play, for there were many. Christopher cannot understand metaphor. This poses challenges when Theatre is built on metaphor yet these challenges are met brilliantly well in Simon Stephens adaptation of Mark Haydon’s novel. 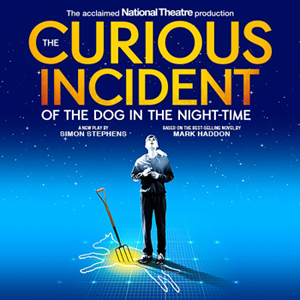 Curious Incident could be described as a coming of age tale which documents the challenges in Christopher’s life as he deals with the confusing events surrounding him including his relationship with his mother and father and his attempts to make sense of these events, falling back into his comfort zone of science and mathematics which provides far greater certainty for him, when pressures become too much. Mixing a mixture of humour and unambiguous honesty in the writing, followed by superb performances by the ensemble cast notably led by Scott Reid (Christopher) we see a brilliantly realised performance which blends styles fabulously. The National Theatre’s collaboration with Forced Entertainment ensures that beautiful movement ideas are supported by top level technical capabilities. Set design by Bunnie Christie could at first glance be seen as fairly simple yet contains within it some glorious little “easter eggs” which delight with their cleverness. When the projection and AV is added to the mix then the overall design becomes something quite special. To use eight projectors to realise Finn Ross’s video design goes well beyond my comprehension but the result is something incredible, beautiful and definitely worth seeing. I’m probably a bit late to the party in terms of putting my thoughts down about this play since it opened at the National Theatre five years ago, and has been touring regularly ever since, so anything I have said and might say has probably already been said many times before by worthier critics. I could write gushing platitudes although that’s not my style. There’s not much that can be criticised though and that deserves credit to the entire company who tell a fabulous story in an enviably exciting and original way. © 2008-17 Manchester Salon. Simply Better IT deliver the Website and SEO services as an example of how we can Use Technology Better.